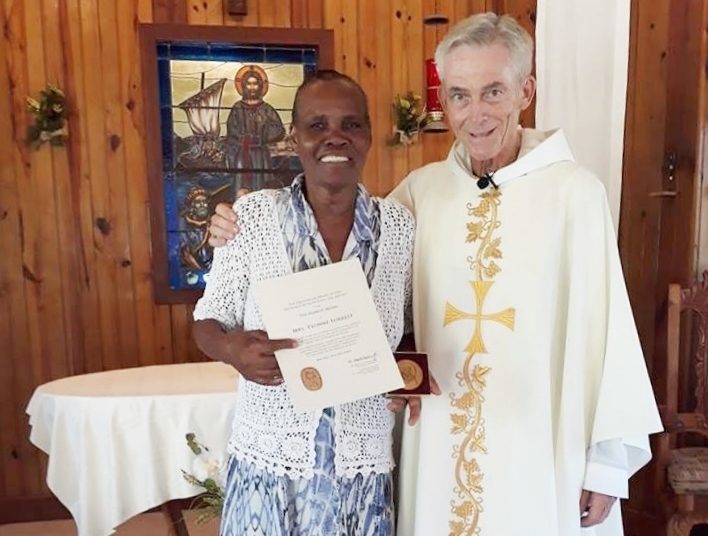 Ms. Yvonne Forrest receives the Francis Medal from Fr. Jim Bok, OFM. • For many years Jasmine (Jaye) Capobianco has generously invested her time and her heart in St. Francis Retreat House in Easton, Pa., serving as a Board member, fund-raiser, project leader and more. 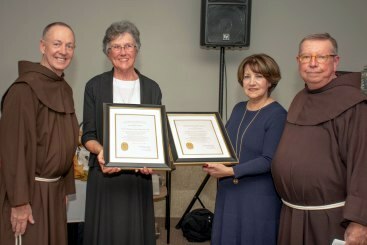 An irreplaceable member of the retreat house family, she received the Francis Medal on Oct. 17, as friends and supporters gathered during the Friars’ Harvest Bistro. • That same evening Sr. Regina Rokosny, OSF, was presented with the Francis Medal for generosity and kindness that have “enriched the lives of the friars and the thousands of guests and retreatants at St. Francis Retreat House, thereby giving concrete expression to the spirit of St. Francis of Assisi.” In addition to her “day job” as Finance Director, Sr. Regina selflessly pitches in whenever the need arises.